Your customers look to you to provide routing, security, and SLA-backed network connectivity at a competitive price. How you deploy those services (via central office or on premises) depends on the customer's needs. Now you can provide those services with the carrier grade reliability your customers depend on—and the flexibility and performance you need to drive new revenue streams while keeping your costs down. 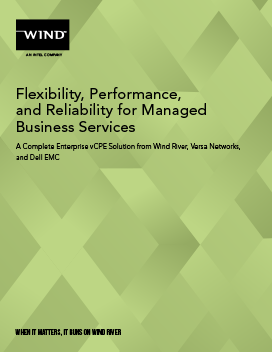 Dell EMC, Versa, and Wind River® have teamed up to create a highly efficient, dynamic, and reliable service-rich virtual enterprise CPE (vE-CPE) reference platform that also has the benefit of being very cost-effective.